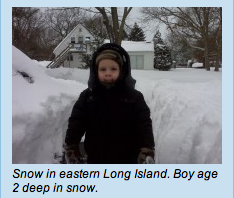 MSE Creative Consulting Blog: "This Is Nothing, When I Was a Kid, the Snow Came Up to My Shoulders!" "This Is Nothing, When I Was a Kid, the Snow Came Up to My Shoulders!" A note of congratulations to the WeatherData and AccuWeather forecasters on their excellent warnings with regard to the record storm in the Middle Atlantic and Northeast. Great job, guys and gals. And, I predict that, in approximately 2037, this young man -- all grown up -- will tell his son how the winters were a lot worse when he was a kid. Pre-Order is up on Amazon! To the Tune of "Away in A Manger"
Just How Good Are Weather Forecasts? The Eagles Have Landed -- In Wichita! "Its A Matter of Faith"
Why is Forecasting Snow So Difficult? "Lemon, Nobody Flies Unmedicated These Days"
Winter Returns to the U.S.!